This blog is one-year old since yesterday. Anyway, this year has been quite an amazing journey, full of learnings, discoveries, and surprises of all kinds. My most memorable souvenir ? The message I received from the daughter of Raymond Loëwy, the day after I posted a top-ten list on his work. Thank you so much, Madame. It's Time To Deliver, Buddy ! * The photography of the day is the ranking of this blog on Technorati, after 10+ months of existence. Goal : reach a 5-digits rank within the next 12 months. Quickly going thru the sidebars, my curiosity drove me to this site *. The Web will never stop amaze me. * no adult content, at least not on the front page but I didn't go further, granted ! Am I a bad blogger ? That is the question I'm asking myself since a while. Actually, since I couldn't find the time to write down some in-depth reviews of the numerous Web 2.0 tools and apps I'm currently testing in regards of the Testing 2.0 project, or comment the way French President Nicolas Sarkozy does Sun Tzu per the book (in french), or explain why Fiber-To-The-Home helps going Carbon Neutral. Today being a Celebration Day for me and lots of other human beings on Earth, it's a perfect day for a new start. Hence my decision to blog each and every day (well, as long as I'll get access to the Web), publishing short posts like many others do with great success. Not that I'm looking for success - at least not for this blog (anyone willing to participate to Testing 2.0 : please don't hesitate to call) - but I realize that " Less is More " also can apply to blogging : short notes posted on the go finally create a coherent way to let your message spread the World - I mean, the Blogosphere. 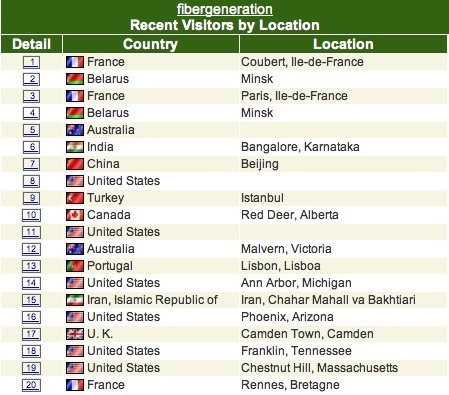 Analyzing FiberGeneration' visitors stats is always a delight to me. On top of the normal *readership feedback gathering* stuff, I travel the World On The Seven Seas in the blink of an eye, for free. Here are the Sitemeter stats as of this afternoon 1:30PM CET, for the last 20 visitors. I have to admit that I do prefer the table version rather than the graphic (i.e. the map) one : discovering new cities, new countries, by reading the names is just a wonderful feeling. How about you ? Just a quick note to apologize for the annoying SnapShot icon displayed with each and every html link on this blog. I'm struggling with the recently updated version of the widget to fix the problem. Last week, I met with the founder of a WebTV startup here in France. During our discussion, the beta test issue came out : she was planning a 2-weeks beta phase, during which a dozen of selected target customers would have access to the WebTV website. And that was pretty it. beta testing is aimed at... testing a beta version of a product. In other words : the objective is to get as much as possible end-users feedback in order to fix bugs which can be detected only in the real life (vs. the R&D lab or the garage) by real users (vs. software engineers and developers), spot user interface' s incoherences, and... get the people used to the product. The Web is... global. Remember "www" ? Stands for : " World Wide Web ". The Web allow anyone to reach anyone in the World (well, there are some limits, but still, you know what I mean). Why would you want to limit your scope to a dozen of people, when thousands can help you build a better product, almost in the blink of an eye ? in today's Web 2.0 environment, every single new website or online tool come up as a "beta". Everybody is used to it now. Especially the people who this startup is targeting. So, one more Web 2.0 firm launching its first product in beta mode won't hurt anyone. speaking of the target audience : the goal of the startup is to create a community of end-users/visitors. What a better tool than a beta phase to create this community spirit ? People will be proud to be part of the development team, they will feel like pioneers, helping at building something new, something great. 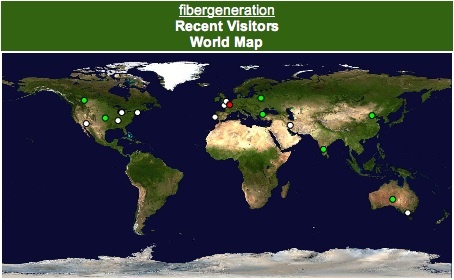 I have registered FiberGeneration on SiteMeter on January 27th this year, means roughly a month ago. As I a pretend to be a smart/creative/efficient (please add your own adjective ;-) Product Marketing guy, I am gathering data for the SWOT analysis of FiberGeneration and its next major revision - the version 2.0 (hey, everything is " 2.0 " those days ;-) is on the roadmap, scheduled Q2 '07 ! 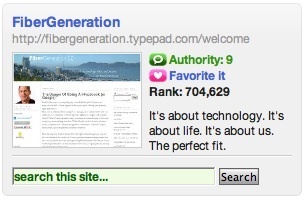 According to the ' fibergeneration.com ' product plan, I have started publicizing this blog a couple of months ago. No innovation here, I am using proven tips & tricks of long time bloggers : do comments on others' s blogs, trackback to relevant posts on others' s blogs, insert the URL email' s signature, tell people about my blog during informal discussions, etc. I tell you : it works. That is the beauty of the Web 2.0 : it let the World know about you in the blink of an eye. Here is the latest mapping of the visitors, as per ClustrMaps this morning. As you may notice, there are people (and computers ;-) from everywhere but Latin America, Africa, and Far East. 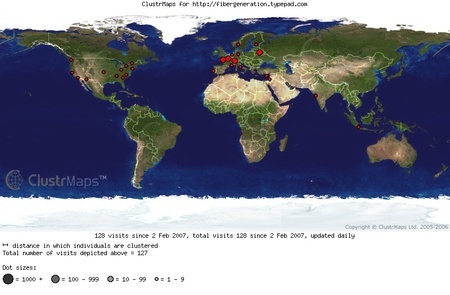 Several folks told me that fibergeneration.com is not accessible from China (maybe TypePad is blocked - I haven't checked the status of blogging in China so far). ps : I couldn't find any blog' post where I could send a trackback with this entry ! To continue with the Top-Ten series, which consists of ten lists of my top-ten stuff in different areas, here is my Top-Ten Favorite Blogs List. I will never stop being amazed by the magic of the Internet. Do a Google search on "Fiber Optic Splice Technician training in u.a.e" *, and read the results : FiberGeneration is listed, and better, is listed on page 1 ! I have changed the layout of the sidebar, adding/deleting/modifying several items to make the sidebar more convenient and easy to navigate. - a Skype button, for you to call me right on the spot (well, when I'm 'online', okay ?). - two buttons : 'subscribe' and 'bookmark', for you to easily set your favorite RSS feed reader, etc. - a digital clock, for the magic ;-). - a search bar, to search things either in this weblog or on the Web, using Google or Technorati for instance. I also swapped a couple of items, to make the navigation more coherent. I let you discover those tweaks ! See you next time, Opera ! It's a given my wife and I will go back to the Opera de Paris soon. However, the title of this post is not about operas and ballets : it's about Opera 9.0, the wonderful web browser which I have been using for the last 2 months or so. A wonderful software, featuring amazing functions, with a cute design. Nevertheless, Opera is not in the Top-3 list of the most popular browsers today, so there are too many limitations using it with most of the web sites at the moment. For instance, no WYSIWYG when typing a post on TypePad, inactive buttons on lots of web pages, etc. That is why I switched to Firefox 2, which is much more supported by almost all web sites now. The lesson of the day : when a niche product you like do not fulfill all your requirements for a seamless/smooth/painless use, give it up. Go for a more mainstreamed one, even if it lacks some of your preferred features or if you don' t like its design : you will increase your productivity anyway ! In the meantime, send your feedback to the vendor/creator of the former and wait for its next major release. Among the handfull Web 2.0 startups that I am currently watching, for what they can bring as new applications or ways of doing business in the Telecoms world, there is Plazes. The Plazes website automatically detects your location and connects you to people and places nearby. It can also be told to remember the locations you visit so you can review your travels. Plazes lets you share your current location with your IM client such as Skype, your blog, or any other application thru third-parties APIs. A nice tool for frequent travellers, and perhaps a lot more. This afternoon, I have spent almost one hour trying to upload the eight locations corresponding to my actual clients and partners across the planet. No chance ! Everytime I want to add a new location, Plazes considers it as my actual one, deleting the previous. Either there is something I didn't catch about the way to do that simple job, either the terminology " beta " is pretty accurate here ;-) As my former boss and still friend was used to say : I will do better tomorrow ! What a great start for a great week to come ! My presentation on my new (ad)venture Wahoom! is now the sixth most popular on Slideshare. With 632 views over 5 days, it is close to the #5 which does 699 views over 6 days. However, I'm far away of the Number One, who hits more than 1,100 views for 4 days on the show only. I got no comment so far, but I'm not the only one in the Top-10 ;-) So, I understand that Slideshare' s audience is mostly composed of people looking for great images - i still wonder about the content, when it's not about a Web 2.0 thing. Then, I created a new slideshow this morning, containing only photos, to compare with a more * serious * one (e.g. a business oriented presentation). It's available here. After 12 minutes on the Web, it got already 2 views. I owe you the truth. I have not posted my weekly photo on Friday last week. I did today, Monday morning, using the 'Publish On a specific date' feature of TypePad. * The Art of The Start, Guy Kawasaki. I have modified a couple of things on this blog today. First of all, the 'About Me' page is now completed, with a bunch of new posts - written today but dated October, thanks to the magic of html ;-) and a couple of downloadable files. I also changed my favorite blogs list, which is now simply using a BlogRolling' blogroll (Heck, I love the Web 2.0 terminology ;-). Last, I have disabled the 'Pacte Ecologique' banner, for I am looking for a nicer version of it. Thanks (for) Giving me one more day ! Tomorrow is Day One of FiberGeneration. After six weeks of beta testing, tuning, churning, it's time to launch this blog in the Blogosphere. For Eternity (I mean, until I decide to switch it off ;-), for Ever (I mean, as long as it will have readers), or for a while (I mean, until I see that nobody reads it ;-). The readers of this beta version of my blog may have noticed a change in its overall design. The first version was using the pre-defined "Becket" theme , just because I love dark/black themes - maybe my Zen side. After reading the comments on a post about readability of dark themes last week on the famous Signal vs. Noise blog, I decided to switch to a more common yet popular light theme. Black on white is less eye-tiring than white on black for you readers. I am using several widgets on this weblog, as you may have noticed already. One of the most impressive, at least to me, is the one provided by Widgetbox - see at the right hand-side column : 'Yahoo! Finance', 'One Frame At A Time', and my Skype status are three widgets from three different sources embedded into a single one, managed by WidgetBox. Very nice, very easy to set-up : you select the widgets you want to insert on your blog, put them into your own widget panel on WidgetBox, and click 'Publish'. Poom, done : your blog now features those widgets. Pretty cool, huh ? For a Business Dev guy like myself, a blog needs an audience which grow day after day (well, week after week will be fine ;-). My first objective : be listed in the "Blog Scratching" section of Guy Kawasaki' s blog by end of Q2'07 (hey, I'm a Marketing guy : no precise date when you don't know if you can make it). I am working on it.